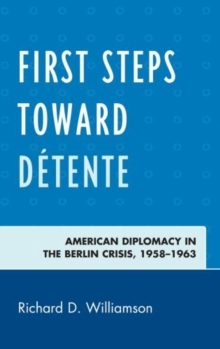 Richard Williamson's First Steps toward Detente provides a history of negotiations conducted from 1958-1963 between the United States, its Western allies in Europe, and the Soviet Union, in order to resolve the Berlin crisis. These negotiations established ongoing patterns of backchannel, ambassadorial, foreign minister and heads of state discussions. From Khrushchev's visit to the United States in 1959 and the difficult Paris 1960 and Vienna 1961 summits to the construction of the Berlin Wall, disarmament remained a parallel concern dependent on Berlin's resolution. Throughout most of 1962, the United States and Soviets made rigorous attempts to break a stalemate at Checkpoint Charlie, though neither side was truly ready to forfeit. Ultimately, the renewal of Berlin harassments and the Cuban missile crisis put an end to these efforts, but the closer relations that had developed through Berlin talks helped to enable the Limited Test Ban Treaty in 1963. The Berlin Crisis signaled a transition away from multilateral East-West relations to a bilateral U.S.-Soviet relationship, remaining oriented to military positions in Germany. In this book, Williamson explores the significance of these events and shows how the negotiations held between 1958 and 1963 provided the templates for detente.